The Z8000 ("zee- or zed-eight-thousand") is a 16-bit microprocessor introduced by Zilog in early 1979, between the launch of the Intel 8086 (April 1978) and the Motorola 68000 (September 1979). The architecture was designed by Bernard Peuto while the logic and physical implementation was done by Masatoshi Shima, assisted by a small group of people. The Z8000 was not Z80-compatible, and although it saw steady use well into the 1990s, it was not very widely used. However, the Z16C01 and Z16C02 Serial Communication Controllers still use the Z8000 core. Federico Faggin, then CEO of Zilog, believes that the reason why Z8000 lost the race with Intel's 16-bit processors is that Zilog was mainly owned by a single investor – Exxon Enterprises – which had an ambition to compete with IBM. Therefore, IBM didn't even consider Z8000 as a processor for its hugely successful IBM PC. The Zilog Z80000 was a 32-bit follow-on design. Although fundamentally a 16-bit architecture, some versions (such as the Z8001) had 7-bit segment registers that extended the address space to 8 megabytes. The register set consisted of sixteen 16-bit general purpose registers, labeled R0 through R15. These can be concatenated into eight 32-bit registers, labeled RR0/RR2/../RR14, or into four 64-bit registers, labeled RQ0/RQ4/RQ8/RQ12. The first eight registers can be subdivided into sixteen 8-bit registers, labeled RL0 though RL7 for the lower byte and RH0 through RH7 for the upper byte. Register R15 is designated as stack pointer. On the Z8001, register R14 is used for selecting the stack segment. There was both a user mode and a supervisor mode, selected by bit 14 in the flag register. In supervisor mode, the stack registers point to the system stack and all privileged instructions are available. In user mode, the stack registers point to the normal stack and all privileged instructions will generate a fault. Like the Zilog Z80, the Z8000 included built-in DRAM refresh circuitry. Although an attractive feature for designers of the time, overall the Z8000 was not especially fast. Eventually it was overshadowed by the Intel x86 family. 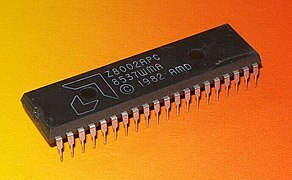 In the early 1980s, the Zilog Z8000 CPU was popular for desktop sized Unix machines. The onchip MMU reduced manufacturing cost by eliminating the need for additional support circuitry required to support virtual memory. These low-cost Unix systems allowed small businesses to run a true multi-user system and share resources (disk, printers) before networking was common. They usually had only RS232 serial ports (4–16) and parallel printer ports instead of built in graphics, as was typical for servers of the time. Jan 1980: C8000 from Onyx Systems, early Unix multi-user system, demoed (8 serial ports [users], $25k). 1982: Olivetti M20, a non IBM-compatible PC that ran Olivetti PCOS, a derivative of COSMOS or CP/M. 1980-1986: Olivetti Linea 1 S1000, S6000, M30, M40, M50, M60, M70. These minicomputers from Olivetti all ran BCOS/COSMOS. 1987–1989: the East German EAW (Elektro-Apparate-Werke) produced the Workstation/Multiuser System P8000 based on the East German U8000 clone of the Z8000. The Zilog S8000 computer came out with a version of Unix called ZEUS (Zilog Enhanced Unix System). ZEUS was a port of Unix Ver 7 and included what were referred to as 'the Berkeley Enhancements'. ZEUS included a version of COBOL called RM/COBOL (Ryan McFarland COBOL). The availability of RM/COBOL allowed many commercial applications to be quickly ported to the S8000 computer although this did not help its long term success. The S8000 did find some success with the IRS and tax preparers in United States, who used the model for processing of electronically filed tax returns. Namco used the Z8000 series in its Pole Position and Pole Position II arcade games. Two Z8002's (small-memory versions of the Z8000) were incorporated into the design of the hardware. The reported inclusion of the device within military designs perhaps provides an explanation for the continued survival of the Z8000 today, in the shape of the Z16C01/02 Serial Communication Controllers (SCC). The end of life notice from Zilog was sent in 2012. Several third parties manufactured the Z8000 including AMD, SGS-Ates, Toshiba and Sharp. ^ a b "ZILOG Z8000 (APRIL 1979)". Digital History: Time Line. old-computers.com. Retrieved 2009-07-16. ^ Hendrie, Gardner (2006). "Oral History of Federico Faggin" (PDF). Computer History Museum. Retrieved 2017-01-24. ^ "Oral History Panel on the Development and Promotion of the Zilog Z8000 Microprocessor" (PDF). ^ Granneman, Scott. "Computing History 1968–Present". Retrieved 2009-07-16. ^ a b Kranenborg, Jurjen; Elvey, Dwight K.; Groessler, Christian. "The Z8000 / Z80,000 / Z16C00 CPU homepage". Retrieved 2009-07-16. ^ "E. German Businesses See Tough Times After Merger". Sun Sentinel. Retrieved 2015-07-03. ^ "efile History - Electronic Tax Filing in the United States". Retrieved 2012-12-13. ^ Bezroukov, Nikolai (2008-11-15). "XENIX—Microsoft's Short-lived Love Affair with Unix". Softpanorama. Retrieved 2009-07-16. ^ "Z8000". TechEncyclopedia. TechWeb. Retrieved 2009-07-16. ^ "Z16C0110PSG and Z16C0210PSG End of Life (EOL) Notification" (PDF). Retrieved 2016-07-17. Zilog Z8000 CPU Technical Manual (PDF). San Jose, California: Zilog. Retrieved 2009-07-16. Zilog Z8000 CPU User's Reference Manual (PDF). San Jose, California: Zilog. 1982. Retrieved 2009-07-16. "Z16C01/Z16C02 Product Specification" (PDF). San Jose, California: Zilog. 1995. Retrieved 2009-07-15. Lehmann, Oliver. "poto.de: Zilog S8000". Retrieved 2009-07-16. Fawcett, Bradly K (1982). "The Z8000 microprocessor: a design handbook" (PDF). Englewood Cliffs, N.J. : Prentice-Hall. Retrieved 2013-03-06. This page was last edited on 26 February 2019, at 03:35 (UTC).